When writing historical novels based on true events, the challenge is to not make the scenes read like dry, academic research for a thesis. My award-winning historical novel, Stone Woman: Winema and the Modocs, offers many examples of how (hopefully) not to bore readers. I will present some scenes to illustrate what I mean. As it is with most stories about Native Americans, the conflict emerges from their desperate struggles to protect their culture, their way of life, from white America as Manifest Destiny drives it westward. 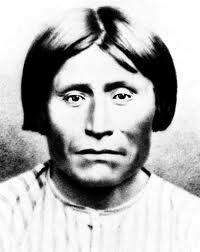 It was no different for the small Modoc tribe of southern Oregon/northern California. In fact, their story serves as a microcosm for just about all the tribes of North America, whatever their size. “Our Father, I am sorry, you do not want to be troubled with such foolishness! Let us speak of the basdin. I suppose you are keeping an eye on them. More and more they were the subjects of conversations in the winter temescals. I have not yet seen one; I do not think I ever want to. Some of our men wear their clothes and carry their awful guns. But they have gotten these from the trading councils in the far-off northern place called The Dalles, not from the ones who have come to our land. They have killed some of the People and we some of them, although the Lagi has said we should avoid them. My father agrees with our chief. The Lagi gestured for silence. For a few moments the frail kyog, whose eyes were shut, rocked from side to side. The cracked lips then parted. A deep imposing voice carried through the village. “I walked in the new grass of a mountain meadow,” he began. “Subbas dominated an endless blue sky, warming my old bones. Children splashed in a stream, where fish of great size leaped. Deer and longhorn sheep grazed nearby, and eagles swooped low to hear the sound that blanketed the meadow, the sweet words of the Kamisnostinto, the ancient love song. “No, no!” an old woman moaned, and eyes turned toward her. But the kyog seemed not to hear as he went on with his vision. “A cloud appeared from over the mountains, blacker than anything I had ever seen. It blotted the sky as it floated toward the children. Their wails became louder, rivaling the thunder. I wanted to run to them but could not move, for my legs had no feeling. Nor could I call out, for my voice was lost among the other sounds. “Now there was no blue sky, and the meadow grass wilted. From the hovering darkness a great hand was thrust out, a white hand, and it seemed to be gesturing. One finger pointed toward the children. The Modocs dispersed; soon the area around the kyog’s wickiup was deserted. 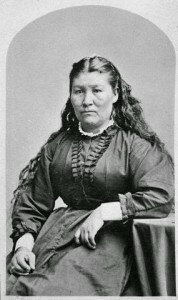 Nanooktowa would have preferred walking home with her father, but he again left to be with the woman. Koalaka joined her family, leaving only Uleta. The boy remained mute during the brief walk. He, like the others, had been deeply affected by what they had just heard. He soon left, and she was glad, for her own mind reeled from the images planted there by the kyog. The night passed in restless turning for the girl, because she was a child of dreams, and unlike the confused tribe she had an idea of what the dark vision meant. As I have always said during my many years of teaching, truth is often stranger than fiction, but fiction can be far more compelling than truth. 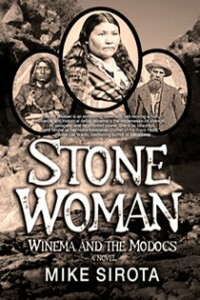 Remember that when you check out Stone Woman: Winema and the Modocs.